• Authentic U.S. IKE Eisenhower Dollar. • Each Coin Serial Numbered of 376. Here is your chance to own one of the most Limited Edition Genuine Legal Tender coins ever made. Each coin is beautifully colorized on the front with an iconic image of one of the most famous icons in the world! Colorizing coins involves the unique application of special inks directly to the surface of a coin using a unique and painstakingly multicolor coin process that achieves a level of detail, color saturation, and durability that is #1 in the industry. The result is an everlasting colorized coin collectible of ultra-high quality. On the back of the coin features its own unique serial number which was laser printed on the coin itself…a coin world first! Each coin is limited and individually serial numbered of only 376 coins worldwide. Once the edition is sold out it will never be made again. Each coin used is a genuine and authentic 1976 Bicentennial Eisenhower Dollar. This 1976 Ike Dollar was only produced during one year by the US Mint in a very limited production, and was called the Bicentennial issue. The coin is super large and features the Liberty Bell superimposed against the Moon. On top of all these great features, the coin itself is entirely layered with 7mils of Genuine 24 Karat Gold. 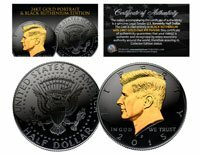 You get a full color Certificate of Authenticity with each coin and a coin capsule. OFFICIALLY LICENSED!